Within organisms, the skeletal system provides support and protection for the body’s many internal organs. Humans have an endoskeleton, in which our bones lie underneath our skin and muscles. In other animals, such as crustaceans and insects, there is an exoskeleton on the outside of the body. 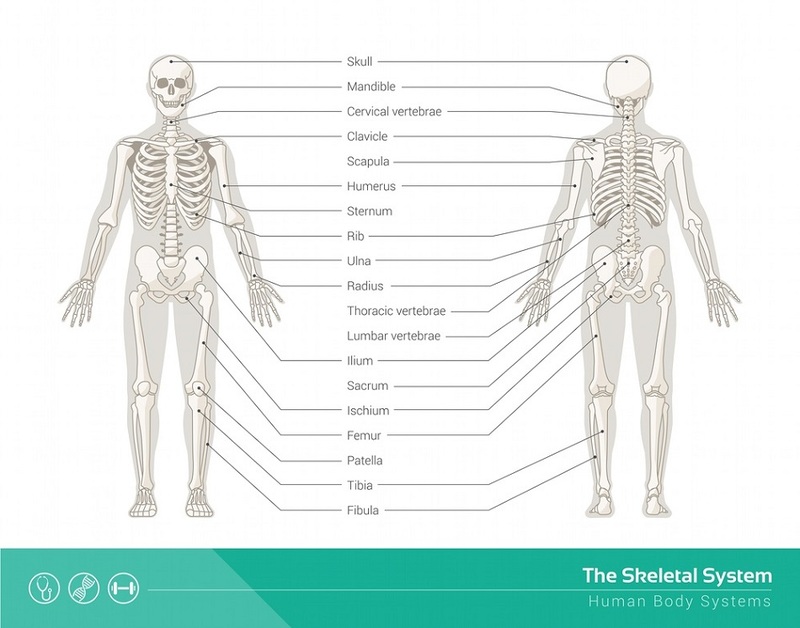 In humans, the skeletal system consists of bones, joints and associated cartilages. An adult human has 206 bones in their body and variety of different joints. Image shows a human skeleton with the major bones labeled. The skeleton can be divided into two components: the axial skeleton and the appendicular skeleton. The axial skeleton is formed around the central axis of the body and thus includes the skull, spine, and ribcage. It protects the brain, spinal cord, heart, lungs, esophagus and major sense organs like the eyes, ears, nose, and tongue. The appendicular skeleton is related to the limbs and consists of the bones of the arms and legs, as well as the shoulder and hip girdles. The first and most apparent function of the skeletal system is to provide a framework for the body. The presence of a firm bony skeleton allows the organism to have a distinctive shape adapted towards a particular lifestyle. For instance, in a fast-moving animal like the cheetah, the skeleton contains long, thin limb bones and an extremely flexible spine. The structure of the skeleton also allows it to absorb the impact of running at high speeds. The bones of birds are hollow, light and create a streamlined body adapted for flight. Many animals even have sexual dimorphism in their skeletons. In humans, while this dimorphism is fairly limited, there are differences in the angle of the pelvic bones, to accommodate pregnancy. The second obvious function of the skeletal system is the role it plays protecting the fragile internal organs. In humans, this is seen in the skull, which surrounds the brain completely. It is also exhibited by the ribcage, which surrounds the lungs and heart but still allows for expansion. Even invertebrates like snails and prawns often have hard exoskeletons to protect themselves from predators. The rigid endoskeleton allows the body to rise up above the ground or stand upright, and bears the weight of the organism, and provides the scaffolding for movement. Muscles generate the force required to move bones at joints. Muscle fibers contain actin and myosin, two protein filaments that can slide past each other to change the length of the muscle. When a nerve impulse arrives at the neuromuscular junction, it signals the muscle to contract. The force generated by the contracting muscle either pulls two bones together or apart, based on the nature of the interaction between the muscle and joint. The central part of a bone contains the bone marrow, the primary site for blood cell production in adult humans. There are two types of bone marrow in adults. Around 50% is red bone marrow containing hematopoietic stem cells and supportive tissue. The rest is yellow bone marrow made of fat and its proportion increases with age. Bone marrow will revert to a higher proportion of red marrow if the body suffers an injury and needs to create more red blood cells. The bone marrow composition also changes during pregnancy and lactation in mammals. Over the course of gestation, blood volume increases by about 1.5 liters, and even the concentration of red blood cells and white blood cells increase. In addition to producing red blood cells, bone marrow within the skeletal system is the origin site of a number of other cells. These include lymphocytes, which are immune cells that travel the lymphatic system. In addition to providing immune functions, the skeletal system is also responsible for hosting stem cells which can differentiate into muscle cells, cartilage-producing cells, and cells that create bone (osteoblasts). Osteoblasts in bone also have an endocrine function, secreting a hormone called osteocalcin. It requires vitamin K to be synthesized and is an anabolic hormone. It mediates an increase in insulin levels and increases the sensitivity of the body to insulin. Osteocalcin contributes to an increase in bone mass and bone mineralization. The bones of the skeletal system act as a storehouse for calcium ions, changing the quantum of mineralized deposits within bones to maintain plasma calcium ion concentration within a narrow range. Calcium ions can affect crucial sodium ion channels in the plasma membrane of every cell, thereby affecting overall homeostasis. For this reason, changes to the concentration of calcium ions have particularly adverse effects on excitable cells in the nervous system, and in cardiac, skeletal and smooth muscle. Different interacting hormones maintain the balance of calcium ions in the plasma and bones, especially the parathyroid hormone secreted from the parathyroid glands in the neck. Bones serve a variety of functions, but the most important is supporting movement of the limbs and body. Two bones or cartilages are held together at a joint through tough connective tissues called ligaments. Muscles are securely attached to bones through flexible but inelastic connective tissue called tendons. Muscles, joints, tendons, and ligaments are part of the intricate machinery that allows the movement of different bones. Functionally, joints can be divided into three classes based on the range of movement they allow in the associated bones. Immovable joints are formed when two bones are held together by fibrous connective tissue with no synovial fluid. These kinds of joints hold the bones of the cranium together. Partially movable joints are also called cartilaginous joints and are present in the spine and ribs. The third type of joints are called synovial joints and have a fluid-filled synovial cavity that allows the interfacing bones the largest range of movement. Based on the structure of the synovial joints, they can be classified into 6 types, including the hinge joints of the fingers and the ball and socket joints of the hips and shoulders. Each bone is made of complex sets of cells, tissues and a specialized extracellular matrix. The two main cell types are called osteoblasts and osteoclasts with mostly opposing functions. While osteoblasts are involved in the formation of bone, osteoclasts are associated with a reduction in bone mass. The extracellular matrix of the bone consists of collagen and other organic fibers as well as the inorganic component containing calcium salts such as hydroxyapatite. In the interior of bones, a soft tissue called the bone marrow plays an important role in immunity and hematopoiesis. The bone is also richly supplied with nerves and blood vessels. In general, the skeletal system is structured to provide support against gravity and protect an animal’s internal organs. While this article mainly discusses the human skeletal system, most animals have some sort of skeleton. Some animals, like sponges, can have an extremely simplified skeleton made of calcium deposits within the animal. Others, like the turtle, have drastically modified their skeletal system to provide extra protection. While this article mostly discusses an endoskeleton, many animals use an exoskeleton for the same purposes. Instead of bones being on the inside, the bones, protective plates, or chitinous skeleton actually surrounds the muscles. While this may seem completely different, the structure of the system is still very similar. The only difference is that muscles and tendons connect to the inside of the system, rather than to the surface of bones. The structure of the skeletal system reflects an animal’s evolution, as well as the needs it has to survive. For example, humans have a tailbone. This is an evolutionary relic, from the time when our ancestors had tails and were swinging from the trees. As we became bipedal, we lost the need for a tail, and it was reduced to a single, nonfunctional bone. Likewise, all animals are constantly adapting and changing their skeletal system through evolutionary time. Diseases of the skeletal system could be confined to one section of the skeleton such as changes to the curvature of the spine, or they could be a genetic disorder affecting all bones and joints such as arthritis or osteoporosis. The spine in healthy individuals is S-shaped, with a convex curvature for the thoracic region and the concave tilt in the cervical and lumbar regions. This shape for the spine is ideally suited for an upright walking posture. If either the thoracic or lumbar regions have a change in curvature or there is sideways bend to the spine, it can lead to back pain, difficulty with breathing, digestion, mobility, and reproduction. The bulk of the weight of the upper body is transmitted along the central axis towards the legs. When the bones or muscles of the back or not functioning optimally, it can lead initially to accommodative changes in posture and thereafter to pain, injury or permanent deformity. Since the spine surrounds the spinal cord, abnormalities in the skeletal structure of the spine can affect the nervous system, either manifesting as pain, tingling or numbing in the extremities. Additionally, the spine supports the ribcage, enclosing the heart, lungs, and diaphragm. Thus, spinal deformities can also lead to shortness of breath, palpitations or even cardiac arrhythmias. Kyphosis is the term for the convex curve of the thoracic region and excessive curvature in this region is called hyperkyphosis. Extreme hyperkyphosis presents as a hunchback. This could arise from genetic factors or poor posture due to obesity or osteoporosis or arthritis. The normal concave structure of the lumbar region is called lordosis, and when the region is overly arched, it is called lumbar hyperlordosis. In hyperlordosis, shoulders appear to be pushed back, while the abdominal region seems to be jutting forward. Image shows a person with hyperlordosis. 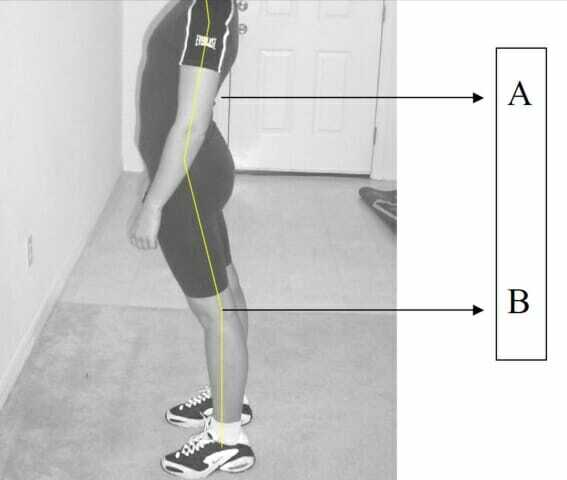 In a healthy spine, the midpoint of the spine (A) would be directly above the knee (B). Hyperlordosis can arise from genetic factors, poor posture, or even deficient muscle strength. When the spine has a sideways tilt, or a lateral bend, it is called scoliosis and could be associated with both hyperkyphosis and hyperlordosis. Osteoporosis is a condition marked by bone resorption. This reduces bone mass and density, thereby enhancing the probability of fractures from even minor stressors such as sneezing. Although osteoporosis is commonly associated with aging, smoking, obesity, diet, some medications and alcohol consumption can contribute to the progression of the ailment. Weight training, exercise, and a diet containing adequate calcium, iron, phosphorous as well as Vitamin D, help in enhancing bone density and bone mass. There is some evidence that the pH of blood plays a role in the release of calcium stores from bones and the extent of bone mineralization since calcium salts are often used as buffers in acidic environments in the body. A whole-foods, plant-based diet has been shown greatly reduce blood acidification. As a result, it also lowers cases of osteoporosis. Arthritis includes a number of joint disorders that are characterized by stiffness, inflammation, and pain. While there is a range of potential causes, arthritis usually worsens with age, affecting the joints that are used most frequently – especially the joints in fingers, hips, and knees. Arthritis, therefore, causes disability, restricts movement and impairs fine motor skills. Three bones in the inner ear, called malleus, incus and stapes, are the smallest bones in the human body. The thigh bone, or femur, is the largest bone. The hyoid bone situated behind the lower jaw is also called a ‘floating’ bone because it is not part of any joint, and is not directly attached to any other bone. The position of the hyoid bone makes it extremely resistant to fractures. However, autopsies that reveal a broken hyoid bone indicate death from strangulation. Newborn babies have about 300 bones. Many of these bones fuse together to form the 206 bones of the adult. Teeth are part of the skeletal system. However, they are not bones. 1. Which of these is an inflammatory condition? 2. Meat, carbonated beverages, cheese, eggs and even milk have been linked to a decrease in blood pH. How might these things affect bone health? 3. Why is the hyoid bone called a floating bone? 4. Why do babies have more bones than adults? A. Some of the bones fuse together during normal development. 5. Which of the following are functions of the skeletal system?